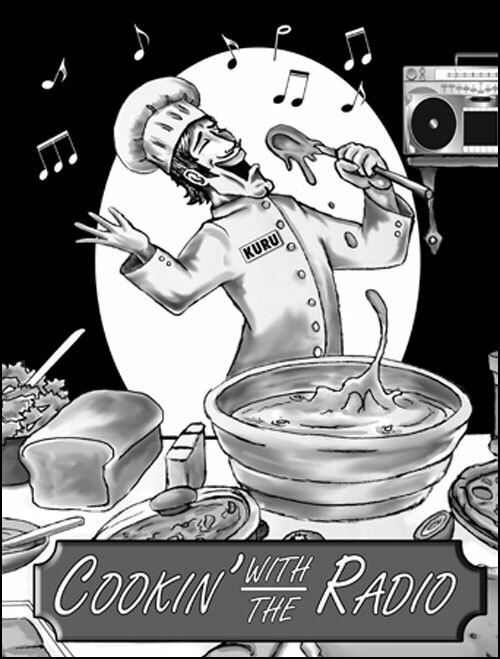 Things Really Are Cookin’ With The Radio! The Cookin’ With The Radio Cookbook has developed beyond our expectations. The layout is complete and Sarah Johnson is doing the final tweaks before we go to press. We are also very excited about our many young artistic contributors that have provided illustrations throughout the book. And what a fine fella that Joe Kellerman is for doing the wonderful cover art! Monica Rude and Jeanie McLerie have done a fantastic job shepherding the project. We have dozens of recipes! Thanks, Cooks! Several of the recipe contributors will be making their featured dishes and you will be able to get you very own copy of Cookin’ With The Radio! Just in time for the holidays and they make great gifts! Better come early as only a few crumbs were left at the previous Cookin’ With The RadiOpen House! Thanks to all that brought and are bringing dishes and be sure to get your copy of the Cookin’ With The Radio Cookbook! so you can recreate those yummies! And many thanks to our sponsors! At Gila / Mimbres Community Radio we believe tasty, nutritious food contributes to healthy & resilient people & community and an awareness of food quality encourages an awareness of food production and waste, and the energy used to grow, transport and prepare it. Chapter and recipe categories include… using a crockpot, solar oven, toaster oven, soups, desserts, chile, greens, fermented, gluten-free, raw foods, snacks for kids of all ages. Proceeds from cookbook sales will benefit GMCR/KURU operations as we continue to encourage community focused programming on a range of issues including food, education, health, animal care, environment and our civic and political processes.